Why do videos in a playlist not have audio when I use VLC? When I play a group of videos sequentially (both shuffled and not shuffled), this weird thing happens when the program will transmit visuals and audio when playing the first video, but then all videos that come after that will transmit only visuals with no audio. I primarily use an external speaker due to the fact that my computer has faulty speakers, but sound still transmits through them. So I tried transmitting audio using the built-in speakers (the ones I said were faulty) and both video and audio was transmitted both all times around. I tried reinstalling the program, but the problem was not repaired. Where is the Audio Track menu? And all the options under Audio are shaded out. Yeah its usually a missing codec. Though when it happened me, i tried opening the video in a different media player (DivX) and that worked for me. Does DivX support MP4 files? I ask because Windows Media Player apparently does not. I followed your advice and went ahead and installed the K-Lite Codec Pack, but it still didn't work. have you tried to reinstall vlc, or use a portable version of vlc with the same playlist? 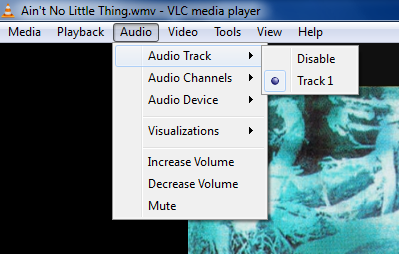 look for audio option in vlc (tools-preference) and toggle between them to see which one will be the best.